Tiffany Alvord, an LDS Artist performed “This is Me” for Hugh Jackman, Zac Efron, Zandaya, and the writers of “The Greatest Showman”, Benj Pasek and Justin Paul. 20th Century Fox hosted a singing competition for YouTube artists to perform their own arrangements of “This is Me” before the show aired on December 20th. The competition prize was tickets for the show’s premiere. Tiffany Alvord, an LDS artist from California, performed “This is Me” in this competition and nailed it in her performance. Just before, Tiffany explained to Keala about how she arranged the song and what it means to her. Keala said she was going to cry even before she heard the song. The Judges had all good things to say about Tiffany’s performance. The Judges loved that she had two other artists helping her perform. It added to the performance but also as Keala said, it added to the theme of unity in the song. One of the songwriters was speechless and said he didn’t know what to say. He told Tiffany she had this hipster Americana vibe going on that he wished he was inside. Hugh Jackman said that their song made him melt into the chair and loved their eye contact. Zack loved that there were three performers with the song and it was all individual, but together it came to be as one. The other contestant, Chester, shared his arrangement with the judges. He said that if he were to win, it would mean that he succeeded in his ability to connect to the music. The last artist, who was Megan Davis, shared that she really got into music when she realized that she had social anxiety. She was able to connect through music. 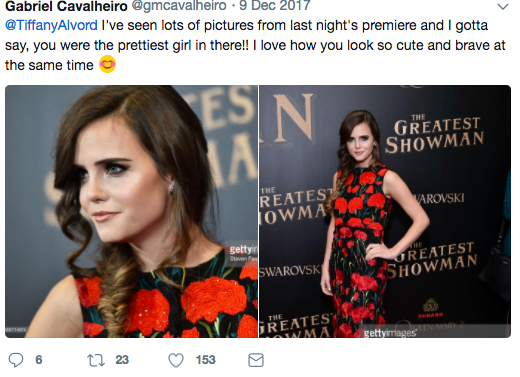 Ultimately, Tiffany Alvord won the competition and won her spot at the premiere. Fans were proud of her performance and loved her look.